Well if I attached the red wire (of an external battery box) to pin 8 and the black wire (of an external battery box) to pin 4 of the attiny85 the torch works well. However I wanted to replace the board and it should work the way it worked before with the programmed mode making use of the battery of the torch light as power source. The battery within the torch light is placed on the back side. 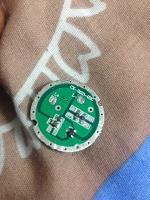 There only the plus side of the battery touches the spring and this gets again in touch with the self made perfboard. Here I am aware that the energy wlil flow through the spring to the soldered microcontrller. Hence alle soldered and connected pins of the attiny 85 will have the voltage of the battery. However I cannot determine certain pins to be charged and some not to be...( here I think I am missing a point) The problem I experience is that only the plus side of the battery, placed in the torch light, gets in touch with the perfboard. The torch light does not work using my perfboard. I know for sure that the torch will work if both the plus and the minus side of the battery are attached to the microcontroller(pin 4/8). 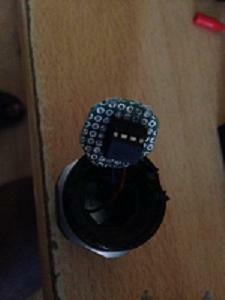 However the initial torch light was also attached only to the plus side of the battery, and it did work. I don't know how. This is the cicuit enter image description here I applied on the perfboard. The batteries are not feasible to be connected that way. Therefore the experiement on the bread board worked unlike with the perfboard applying on its torch light. 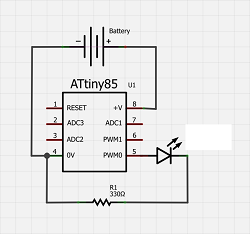 I dont get the minus and plus side of the battery to touch only the respective pins of the attiny. 1.I know I am doing something wrong or thinking little naively, can you give some hints in order to get the torch / flash light to work making use of my customized perfboard? Do I have to ensure that pin8 and pin4 of the attiny 85 are attached with the respective side of the battery to get my torch/flash light work or is there another way to get the flash light to work?